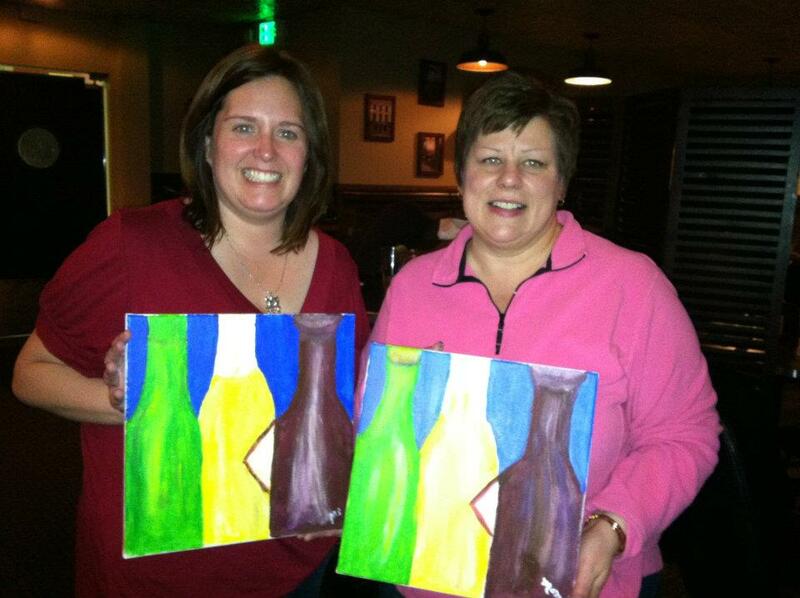 Ever heard of Wine and Canvas? 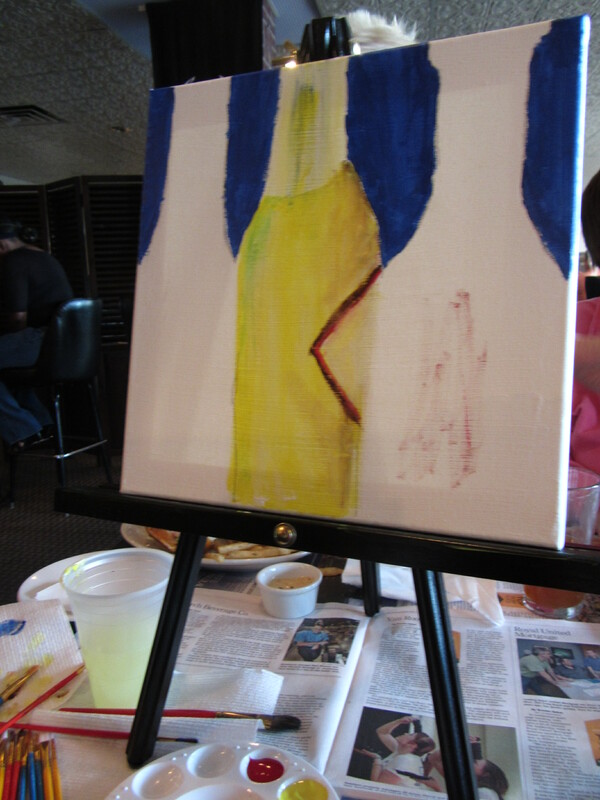 How about Beer and Paint? I’m not an artist by any means. Most of the artwork in my home has come from local big box retailers, until recently. With new offerings in Hendricks County like the Rural Routes to Main Street Cultural Trail, I’ve begun to understand and appreciate local art and Indiana artisan products. Earlier this week, I got to experience both with a trip to Black Swan Brewpub in Plainfield, Ind., to try out Your Artistic Spirits. I’ve been intrigued by the local painting workshops, but this appealed to me much more so because of the local beer. I have a weakness for locally crafted brew, and Black Swan carries many of my favorites as well as their own house varieties. And they have good food to boot. Lisa Curfiss owns Your Artistic Spirits, and the concept is simple. She hires a professional artist to teach a class over a two-hour period where each participant leaves with a custom-painted piece of art. Everyone can follow along with instructions, or they can experiment with free-form painting like the couple next to me that night. Our instructor this week, Kay Quatroche, was very patient with us and offered great tips on mixing paint, using the right brushes and my favorite part – gave us stencils so we could trace the shape of our painting without having to freehand. We were a small group that night, but I really liked the special attention Kay gave everyone. She even made sure that at the end of the event we were happy with our paintings. My friend and co-worker, Becky Moon, joined me, and we had a great time chatting, learning and catching up. We both had dinner as well. She got her tried-and-true ham sandwich on a pretzel bun with fries and bacon aioli, and I tried the Buffalo grilled shrimp appetizer with fries and the sun-dried aioli. 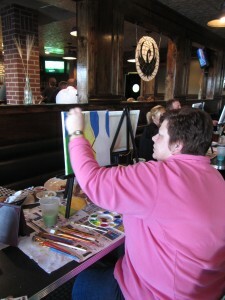 One tip I would add is to go early and have dinner before the painting starts. The class starts at 7 p.m., so I’d get there about 6 or 6:15 to grab a bite to eat. My shrimp was huge and a great portion for dinner even though it was on the appetizer menu. The fries were delicious as always. The class was $35, and you can register online using PayPal through the website. Currently, they have workshops scheduled through the end of May every Monday night from 7 to 9 p.m. at Black Swan Brewpub in Plainfield. When I asked Lisa a time frame for the workshops, she believes they will be in Hendricks County on the west side of Indianapolis indefinitely. I’d highly recommend this experience for a group of friends, couples and adults of all ages. Be sure to swing by their Facebook page. You’ll find a few more photos of Becky and me intently working away on our paintings. Has anyone else tried this? We’d love to hear your feedback. Leave us a comment and let us know if you are going to give it a try or have tips for other readers.